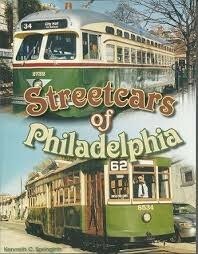 Streetcars of Philadelphia is a photographic essay of Philadelphia's streetcar system. The Philadelphia Rapid Transit Company (PRT) formed in 1902, purchased 1,500 new streetcars between 1911 and 1913 to modernize the system. In 1934, PRT filed for bankruoptcy and emerged as the Philadelphia Transportation Company (PTC) in 1940. New modern Presidents' Conference Committee (PCC) cars were purchased with 450 PCC cars in service by 1948. After PTC came under National City Lines control in 1955, the 45 streetcar lines in 1954 were reduced to 14 in 1958. The Southeastern Pennsylvania Transportation Authority (SEPTA) acquired PTC in 1968 and by the end of 1992 only five subway surface streetcar lines remained in the city of Philadelphia. 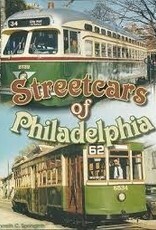 Streetcars of Philadelphia documents the city's streetcar history including the 112 new Kawasaki streetcars in 1980-1982 and the 2005 restoration of Route 15 streetcar service using rebuilt PCCII cars.